Friends of Villa Grande (FoVG) was established in July, 2007 for the primary purpose of preserving and protecting the property in Villa Grande known as Patterson Point. 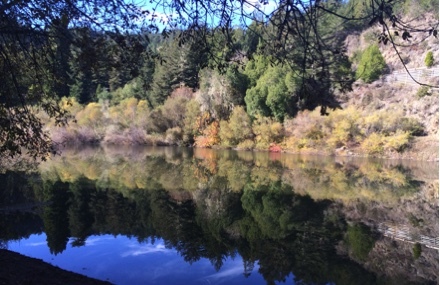 Patterson Point Preserve’s two acres includes 24 coast redwoods and significant native flora and fauna, situated on the Russian River. As stewards of Patterson Point, FoVG is restoring and maintaining the natural features of the property for the benefit of residents, friends and visitors. Villa Grande was founded in the early 1900’s (as Mesa Grande) for vacationers looking to escape the city. Located in western Sonoma County, It was just a three hour train ride on the narrow gauge railroad from Sausalito. Many of the homes in Villa Grande are Craftsman style originals, built for summer use only. Since few homes had full kitchens back then, members of the community often took their meals at the old Villa Grande Hotel. FoVG is building a historical archive - written, photographic and oral - to recognize and preserve details of Villa Grande’s past. Feel free to contact us if you would like to contribute. Our website is designed to introduce you to FoVG membership and activities. Please click here or contact us for more information.